1. Everyone who came out to the fair to support the Atlantic County 4-H program and members. We appreciate that the heat and rain did not keep you away. The kids work so hard through the year so they can show off what they learned at the fair and having someone other than their parents see their accomplishments will inspire them to continue to grow next year. 2. The Fair Sponsors whose donations helped us purchase things needed to provide for the fair. (example: awards, yearbooks, paint, but really so much more). Please see our Sponsor Page on our website and consider using one of these companies. 3. The 4-H Fair Association who gives up hours of their time to prepare for this event. Some of these volunteers don’t even have kids in the program anymore but continue to come out because they believe in 4-H and how important it is for kids to have the opportunity to learn skills that will help them in their future. 4. The leader volunteers who have given up a ton of hours to help teach our kids life skills and lessons over the past year so they could shine at the event. Most of these great people are also part of the Fair Association as well. 5. 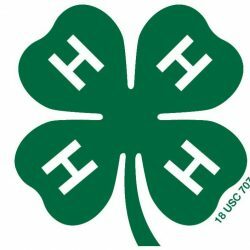 The parents that found 4-H to be a good fit for their child and support them by bringing them to meetings and events and encouraging them to do more. I am sure I am forgetting a ton of different people but we are a little worn out from the past months. Time to recharge and get ready for next year, which starts Sept 1 . Mark your calendars for next years fair Aug 8-10, 2019. Next PostNext September – The beginning of our new project year!